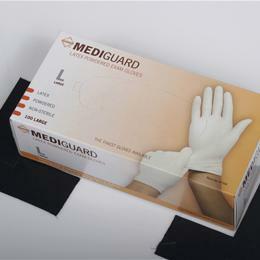 Mediguard Powdered Latex Exam Gloves: Mediguard Powdered Latex Gloves Offer Excellent Sensitivity, Making Them Ideal For Almost Any Application. Powdered With Medical Grade Absorbable Dusting Powder (Usp) For Donning Ease, They'Re Non-Textured With Beaded Cuffs For Added Durability. Meets All Astm And Fda Requirements. A Great Overall Value. Medium.